Peter Pan slot shouldn't need the theme explaining, but if for any reason you are not familiar with Peter then I will briefly explain. Peter Pan is a character created by Scottish Novelist J.M. Barrie. He is a boy, who can fly and is destined to never-grow up (some of us might have a few friends like this). The stories about Peter Pan were originally in books, but have gone onto to be made into plays, movies and games. 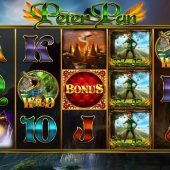 This 5 reel, 3 row, 20 payline slot has symbols from the tales of Peter Pan like Big Ben in London, Neverland, Hook's Hideout and Country House and naturally Peter Pan is present as the game's only stacked symbol. Card symbols make up the rest. Pan is stacked all reels and pays 20x stake for 5-of-a-kind giving a possible 400x stake for the full screen. Wilds in the form of Hook's nightmare, the crocodile, are on all reels and pay no multiplier. Bonus symbols appear on reels 1 and 3 and there are two alternative bonus symbols on reel 5, similar to how their Wild Antics game triggers its various bonuses. You do get 2 in-play features where Pan will appear from the night sky and fly across the game, maybe making the reels give you a decent win or offering the Fairy Jar choice for you, or do nothing at all! The Fairy Jar may offer a Wild which can expand any way(s) or more usually a bonus symbol which nearly always results in entry to one of the game's two bonus rounds. Both bonus games involve picks. If the barrel comes on reel 5 you find your friend Hook hanging in a cave above the open jaws of the hungry crocodile, with barrel racks on each side in the 'Hook Or Crook' game. You pick barrels and each time Hook is there you get a cash multiplier added, until you pick the crocodile and end up in his jaws to end the game. Should Tinkerbell land on reel 5 then you get 'Finding Neverland' which involves choosing jars which either have Pan which means flying on through the clouds for several moves (clouds have trail multiplier awards steadily increasing on them) or you can land a simple number which will move you just one or two places along. Pick wrong and you hit the 'collect' and the round ends. Should you get to the end of the flight through the clouds to Neverland, not only will have accumulated a decent win but you do battle with Hook for a final pile of treasure and significant win!